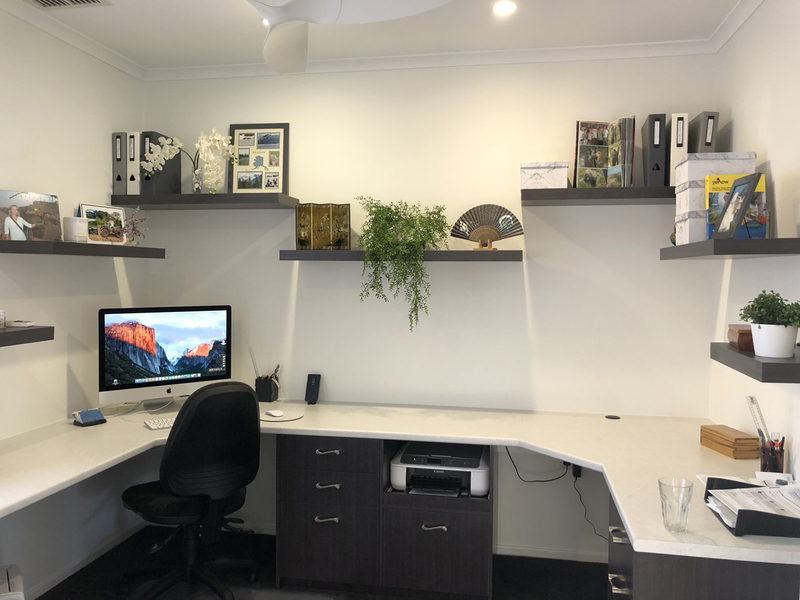 RJP Design and Décor was engaged to create a new home office which allowed for two workstations, a space for the printer and storage. The existing office was quite heavy for the space and was only utilizing one wall. The client was embarrassed by the look of the office as it was so different to the open, airy spaces of the rest of the house, so it was always behind closed doors. RJP Design and Décor designed a new office which was fresh and spacious. The design included two workstations with the printer housed in a pull out shelf below bench height and a charging station for the various technology the family owned. Floating shelves were designed in short intervals so one shelf created a support for folders on the lower shelf. The client is very happy with the result and finds the space very calming now to work in. The doors to the office have even been taken off!